10 or 20 MB however HDD was not standard. The 360 KB 5¼-inch floppy drive(s) could be user replaced to HD 1.2 MB drives. A hard drive of 10MB or 20MB could be installed by the user on a self contained card in one of the expansion slots. The basic machine as bought had only 360 KB 5¼-inch floppy drives. There were versions with one or two drives (shown above). The Amstrad PC1512 was Amstrad‘s mostly IBM PC-compatible computer system, first manufactured in 1986. It was later succeeded by the PC1640. It launched for £499 and sold very well, as it was one of the first cheap PCs in Europe. It significantly helped open up the European PC market to consumers as well as businesses, and Amstrad’s advertising of the PC1512 was aimed at homes rather than offices. The 1512’s influence was such that the UK PC magazine PC Plus originally targeted itself at the “Amstrad PC 1512 and compatibles”, since home ownership of other PCs at the time was rare. The PC1512 shipped with 512 KB of RAM; it could be upgraded to 640 KB of RAM with an expansion pack commonly known as a “top hat”. Video output was compatible with the CGA standard, with an extension allowing all 16 colours to be used in the 640×200 graphics mode. The CPU of both the PC1512 and the later PC1640 was an 8 MHz Intel 8086, which was sufficient for playing The Secret of Monkey Island, Maniac Mansion and Prince of Persia. The power supply was located in the monitor, which made upgrading difficult. Amstrad licensed both MS-DOS 3.2 and Digital Research DOS Plus, which was largely compatible with MS-DOS and included some features from CP/M and the ability to read CP/M disks. Only one of these operating systems could be used at a time. They also licensed the GEM windowing system, which supported the customized CGA hardware of the 1512. The PC1512 was followed by the PC1640, which had 640 KB of RAM and an EGA-compatible graphics chipset (though only the ECD model could display all EGA modes). Either model shipped with one or two 5¼-inch floppy drives, and optionally a hard drive (either 10 or 20 MB). Amstrad also attempted to expand its market share by selling computers in the United States. 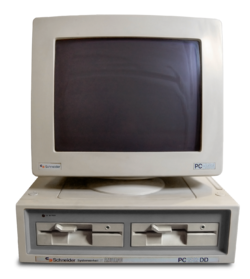 In the US the PC1512 was marketed as the PC6400 and included a 20 MB hard drive and the RAM upgrade to 640 KB. 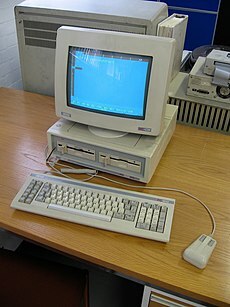 The PC1512 was also sold as the Sinclair PC500. The input devices supplied with the machine were notable. The mouse was an Amstrad Mouse, which was incompatible with serial mice common at the time. It was supported by some games, including Elite, but many DOS programs had problems with it. The keyboard sported an Atari-compatible joystick port for digital joysticks. Joystick movements and buttons were mapped to unused keyboard codes, allowing the joystick to be used in many DOS games that were written for keyboard control. The series was somewhat unusual for the fact that it had a physical volume control on the internal speaker. This allowed the user to make the machine beep quietly, or silently, from boot time onwards. This innovation is still not present in most modern PCs: the legacy beeper is typically still a fixed-volume device, though external speakers connected via dedicated sound hardware do usually have a volume control. Whereas IBM’s PC (and almost all PC compatibles) had a power supply in a corner of the main case, the PC1512’s power supply was integrated with that of its monitor. The monitor had sufficient venting to cool itself by convection, instead of needing a fan. The PC1512 was therefore quieter than other PCs. Rumours circulated that an Amstrad PC would overheat, and while existing owners would note that this did not happen, new buyers were discouraged. As a result, later models had a cooling fan integrated into the main case. Another example of rumour was the suggestion that there were issues with the ‘unshielded’ power supply in the monitor affecting an optional hard drive that could be installed at the back of the base unit and further that this would be solved by taping tin foil or aluminum foil over the back of the base unit or the bottom of the monitor to shield the hard drive. Available as choice of one or two 360 KB 5¼-inch floppy disks drives or one floppy disk drive with a 10 or 20 MB hard disk drive. CGA display with extra 640×200 16 colour mode. Colour or monochrome monitors. Monochrome monitor displays CGA in greyscale, not compatible with more usual Hercules mono display. Three full-length expansion slots – these were accessed through top and side panels with thumb-push locks meaning expansion cards could be added without use of a screwdriver. Four discs were supplied with floppy models, five with hard drive models. Amstrad launched the Amstrad DMP3000 printer, which was an 80 character dot matrix printer with both IBM and Epson compatibility and boasted NLQ (Near Letter Quality) and could handle both A4 and fanfold paper. It connected to the computer via a parallel port. Amstrad also launched the SM2400 modem, which was a quad speed dial-up modem and boasted speeds of up to 2400 baud. It was an internal ISA modem. It was encased in plastic and could fit into Amstrad PC1512 and PC1640. Jump up ^ Dimitrios Angelakos. “FUD – A Marketing Strategy in the Computer Industry”.